The ovary contains all of the female gametes, or oocytes. Mitosis of gametes is completed in females either during fetal life or shortly after birth; that is, there are no more gametogenic "stem" cells (oogonia), and the final pool of primordial oocytes is therefore present. These primordial oocytes are arrested at the diplotene, sometimes also called the dictyate, stage of the first meiotic prophase. The oocytes will remain in this arrested state until they are recruited to begin growing, and for this discussion the most important period of follicular growth occurs after puberty during the estrous/menstrual cycle. Although not all of the primordial oocytes survive, those which do survive become surrounded by a layer of squa-mous epithelial cells, which are derived from the ovarian stroma and/or surface epithelium, and are termed granulosa cells. Together the granulosa cells and oocyte comprise a primordial follicle, which is enclosed by a basement membrane separating the follicular compartment from the rest of the ovary. After the onset of puberty, a group or cohort of primordial follicles begins to grow during the follicular, or preovu-latory, phase of each ovarian cycle (Figure 1). Most of the follicles that enter the growing population regress in a process known as atresia; thus, only a relatively few follicles ever reach the mature, preovulatory stage. In nonpregnant, sexually mature mammals, the ovarian cycle is usually divided into the follicular phase, which is when the follicles are growing and culminates in ovulation, and the luteal phase, which will be discussed later. The ovarian cycle is termed the menstrual cycle in primates and the estrous cycle in nonprimates, but is similar between the two groups in most respects other than the presence or absence of menses. Soon after a primordial follicle enters the population of growing follicles, it acquires a layer of cells outside of the basement membrane. This follicular layer, termed the theca, is derived from the ovarian stroma and is composed of fibroblasts, epithelial cells, and microvessels. The theca subsequently differentiates into the theca interna, which contains most of the follicular capillaries, and the theca externa, which contains mostly arterioles and venules. Figure 1 (A) Schematic depiction of the ovarian cycle, which progresses from the primordial follicle pool, to the cohort of growing follicles (primary, secondary, and tertiary or antral follicles), to the mature preovulatory follicle (also called the Graafian follicle after Regnier de Graaf, who first described them), to ovulation, to the growing corpus luteum (also called the corpus hemorrhagicum), to the mature corpus luteum, to the regressed corpus luteum (also known as the corpus albicans). The mature corpus luteum consists of several parenchymal lobules, each separated by a connective tissue tract (for further explanation, see text). 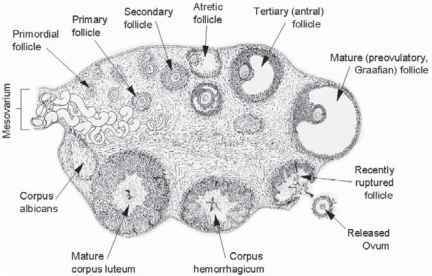 An atretic follicle is shown at the top of the schematic, and the mesovarium (ovarian hilus) is shown on the left. (B) Schematic depiction of the stages of the estrous/menstrual cycle. During the follicular phase, the antral follicles grow and secrete estrogens (E2); during the luteal phase (after ovulation), the corpus luteum grows and secretes progesterone (P4). Note that ovulation occurs at the border between the follicular and luteal phases. Although this schematic depicts the estrous cycle of the cow, it can be applied to any estrous or menstrual cycle by adjusting the number of days and the relative length of the follicular and luteal phases; for example, in humans the menstrual cycle is approximately 28 days long and comprises a 14-day follicular phase followed by a 14-day luteal phase (menses is during the first part of the follicular phase), with ovulation again occurring at the border between the follicular and luteal phases. (A) Adapted with permission from Patten (Foundations of Embryology, 2nd edition, p. 44. 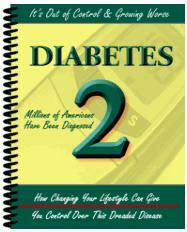 New York: McGraw-Hill). (B) Taken with permission from Senger (Pathways to Pregnancy and Parturition, 1st revised ed., p. 119. Pullman, WA: Current Conceptions). forming this wreath, and especially those closest to the basement membrane, become enlarged and form extensive sinusoids (see the chapter by Ellinwood et al. in The Vertebrate Ovary, which is listed under Further Reading). It has been suggested that this dramatic change in morphology of the capillary wreath surrounding the follicle reflects increased permeability and preparation for invasion into the granulosa layer when the follicle ruptures at ovulation . 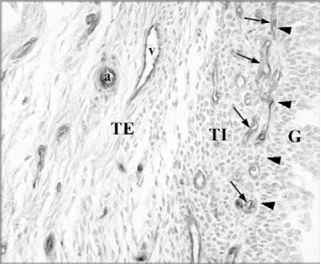 As the follicle grows the granulosa and thecal compartments become multilayered, and the follicle acquires an inner cavity, termed the antrum. The antrum is filled with follicular fluid, which is mostly a transudate of plasma but also contains secretory products from the follicular cells. The thecal microvasculature meets all of the respiratory, nutrient, hormonal, and transport demands associated with follicular development, since the granulosa layer remains avascular and is separated from the thecal compartment by the follicular basement membrane until after the follicle ruptures at ovulation. Just before ovulation, as the growing follicles reach preovulatory size, they begin to produce large amounts of estrogens, which are ovarian steroids. In fact, the preovulatory ovarian follicles are the primary source of circulating estrogens in the female, and the theca and granulosa cells cooperate in its production. 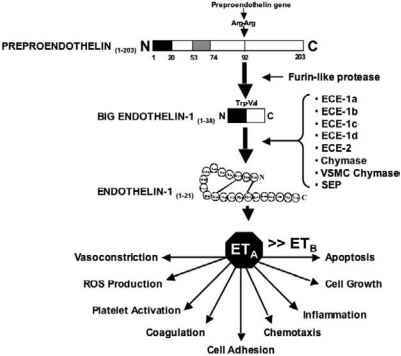 Estrogens, in turn, have an important stimulatory role in many of the primary and secondary sexual characteristics of females, including sexual behavior, and mammary and reproductive tract development, blood flow, and vascular development. For example, if one removes the ovaries, effectively removing ovarian steroids from the system, and then treats the ovariectomized animal with estrogens, uterine blood flow increases by as much as tenfold within 30 to 60 minutes, and uterine size and vascular bed volume increase by two- to fivefold within 24 hours after treatment. The preovulatory surge of gonadotropins from the anterior pituitary, or adenohypophysis, triggers ovulation as well as the resumption of meiosis by the oocyte, a process termed meiotic maturation. Once released from the follicle, the mature but unfertilized egg is "picked up" by the oviductal fimbriae surrounding the ovary and transported to the ampulla of the oviduct where it can be fertilized. After ovulation, the ruptured follicular wall vascularizes and grows rapidly, and is now referred to as a corpus luteum, which reaches its mature size over a period of about 10 to 12 days. Both granulosa and thecal cells of the ruptured follicle contribute to formation of the corpus luteum and, in fact, all of the luteal microvasculature is probably derived exclusively from the thecal microvascular pericytes and endothe-lial cells, both of which invade the granulosa layer within a few hours after ovulation. Early in its life span, the corpus luteum begins to secrete the ovarian steroid progesterone, and is the main source of this progestational hormone. If pregnancy does not ensue, the corpus luteum regresses at the end of the luteal phase, which lasts from a few days to a couple of weeks depending on the species. Once luteal regression occurs, progesterone secretion declines, and a new follicular phase is initiated, again culminating in ovulation (Figure 1). In some species, such as the rat, the corpus luteum does not secrete substantial amounts of progesterone unless mating occurs. However, in all species, the corpus luteum is "rescued" by the presence of a viable conceptus in the uterus. Thus, if pregnancy is successfully established, the corpus luteum does not regress but rather is transformed into the "corpus luteum of pregnancy," and it continues to secrete progesterone, which is critical for successful establishment and maintenance of pregnancy, for the majority of the gestational period. Either somewhat before or immediately after delivery of the offspring, the corpus luteum of pregnancy regresses spontaneously. The growth rate of the early corpus luteum is phenomenally rapid; for example, the doubling time for tissue mass and cell number is about 72 hours. Thus, during its growth phase the rate of luteal growth exceeds that of all but the most aggressive and dangerous tumors. However, unlike tumor growth, growth of the corpus luteum, including proliferation of the steroidogenic epithelial cells and the microvascular cells (vascular smooth muscle cells, endothe-lial cells, and pericytes), is closely coordinated and highly regulated, such that the mature corpus luteum stops growing once it reaches a species-specific size. Thus, the corpus luteum is an outstanding model for investigating the regulation of microvascular growth in a normal, rapidly growing, highly metabolically active tissue. Understanding this process should also give us a much better understanding of what has "gone wrong" in various pathological conditions that are associated with abnormal tissue and microvascular growth, including tumor growth, various retinopathies, chronic varicose ulcers, and nonhealing fractures and wounds. In fact, we have just recently begun to apply our knowledge of microvascular growth in ovarian follicles and corpora lutea to the study of wounds in diabetics, which display delayed wound healing . In addition to being species-specific, the average size of the mature corpus luteum, or the total size of the several corpora lutea present in the ovary in species in which multiple ovulations are common, is closely related to the average mature body size of the species in question. For example, the total weight of mature corpora lutea in the shrew (body weight ~15 g) is about 1 mg, whereas that of the blue whale (body weight =100,000-150,000kg) is about 1kg. This difference in luteal size probably reflects differences in the number of granulosa and thecal cells making up the ovula-tory follicle, and is thought to reflect the importance of having sufficient luteal mass to produce adequate amounts of progesterone to maintain pregnancy. What are 13 stages taken by recruited ova to reach the stage of ovulation?